Video on how a fence brought together a town after one of the worst firefighting tragedies in American history. Article digs into the long, difficult process of mourning after such an incident. "A year ago they arrived with heads bowed, hands held. The air was silent because no one knew what to say. They parked their pickups, their SUVs, their sedans outside Mile High Middle School, and when every last space was occupied, they parked along narrow side streets and vacant lots. Lights blazed from the auditorium, a beacon to those who wanted to be anywhere else. A few hours earlier on a day that soon would appear on marquees, banners and T-shirts — June 30, 2013 — friends and loved ones of the Granite Mountain Interagency Hotshot Crew gathered to hear the worst news possible. 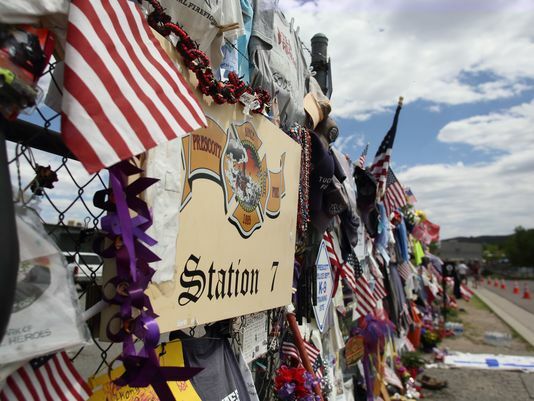 Nineteen had perished at the Yarnell Hill Fire, trapped by flames that moved so quickly several of them had not even deployed their fire shelters. The grief began there, and spread through the city, to the vigil sites, to the public square where the hearses passed by, to the arena where thousands would gather to say goodbye. Nearly a year later, the scenes that contained the drama of those days largely are devoid of reminders of those early days. But the number 19 still has only one meaning in Prescott, and it reverberates as strongly today as it did then."